A Professional Optician will meet with the employees to determine their individual vision requirements. The Optician will ascertain and record prescription specifications, task specific visual requirements, lens type, lens parameters, and frame selection to insure proper fit, comfort, and compatibility to function. Normal delivery schedules are two to three weeks depending on the difficulty of the prescription, lens materials, and options. Emergency service is available for an additional fee. Employee co-pay for budget upgrades can be accommodated. Computer generated invoices are provided for easy reconciliation. Service can be “design specific” for your company. W2 Technologies offers innovative products and services. Since 1997, “On Site” has been a popular service provided by a Florida Licensed Optician. We are constantly updating our frame and lens selections to give our customers the most current options available in Prescription Safety Glasses. The innovative Digital Laser FreeForm technology is our latest addition. This technology will take prescription safety eyeglasses to a whole new level of performance and comfort! W2 Technologies is a distributor of quality ANSI Z87 and CSA Z94.3 rated prescription safety eyewear. With 21 years in the optical business, our company provides small and large businesses with a cost effective, loss prevention tool. Our approved safety labs can produce “changeable” lenses, invisible bifocals, polarized sunglasses, etc., all to strict ANSI Z87.1 standards. W2T also provides convenient procurement of RX Safety Glasses by offering local “on site” services or outsourcing to your local provider. We also provide ergonomic safety products like ERGOKNEEL kneeling mats and the knee pads. 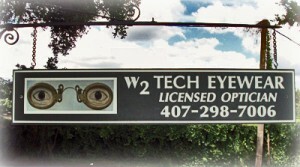 W2Tech is a certified Woman Owned Small Business (WOSB).